Applied memory research investigates the practical aspects of one of the crucial facets of human life experience: Memory. Our ability to make informed, conscious decisions in the present depends on the existence of memories, both consciously and unconsciously obtained, as do the many seemingly automatic tasks we perform every day. From the earliest days of experimental psychology, researchers have attempted to understand the "laws" of memory with a view to application in fields as varied as improvement of learning processes, advertising, mental ability examination, and legal system evaluations. 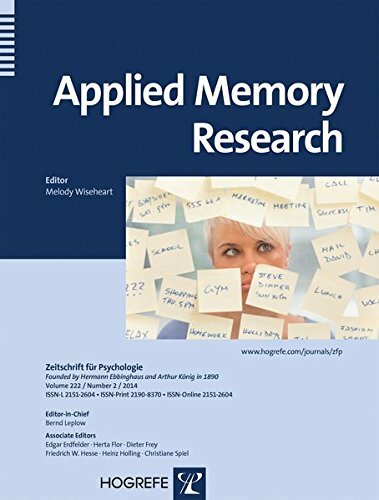 This volume provides the reader with a general sense of the current state of the field of applied memory research. It covers learning and memory within the field of educational psychology, error sources in forensic psychology, language impairment within clinical psychology, and interactions between social and technical systems within industrial-organizational psychology, as well as memory-related aspects of architectural and industrial design. Professor Melody Wiseheart heads the Cognitive Flexibility Lab at York University, Toronto, ON, Canada.